Ah, happy weekend everyone! And a bloody hot one here! On Thursday I ended up not running and working out indoors because it just seemed too hot, I wussed out. :-) Probably a good thing because my insides were a little off, perhaps a bad sample at the farmer’s market and/or a bit of heat exhaustion. I made up for it with a run this morning and hopefully tomorrow morning. Anyway, I’m really enjoying Kris Carr’s video blogs lately and this one really hit a nail for me about ditching a SAD diet and finding a groove that works whether it includes animal products or not. 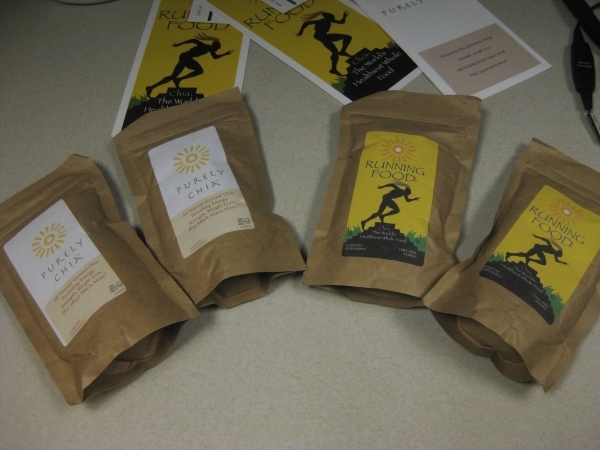 And I’ve been enjoying Running Food in my breakfast smoothies since getting an amazing sampler pack. 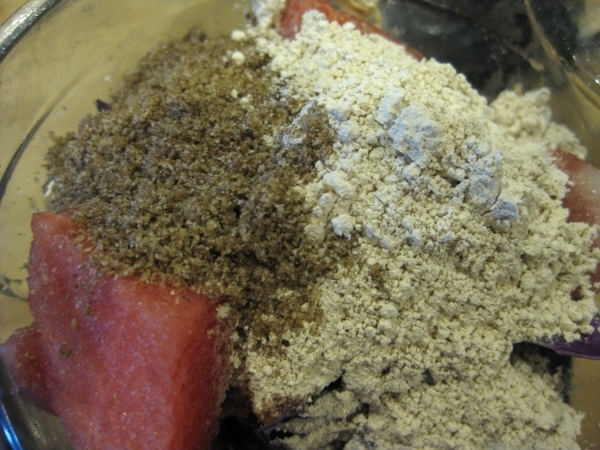 Running Food is finely ground chia seeds to add to smoothies, desserts, cereals, etc. 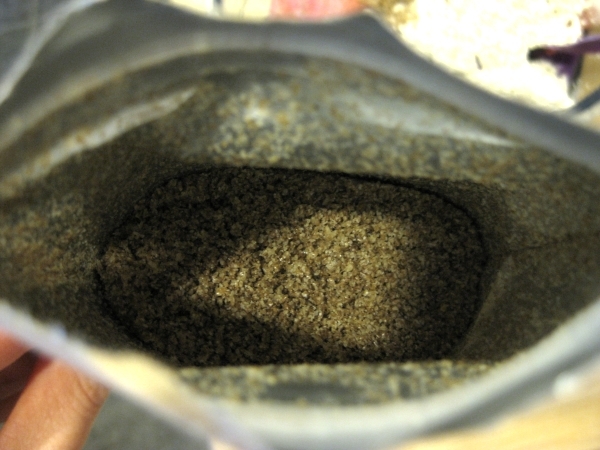 Normally I put whole chia seeds in my smoothies, but in powdered form it blends smoother and quicker, not gritty at all. 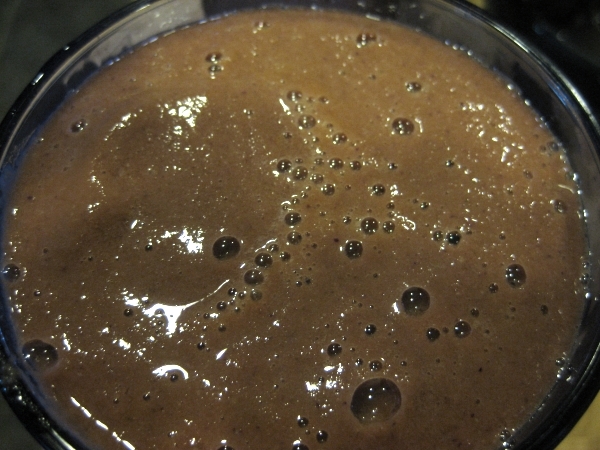 This smoothie also had SunWarrior Vanilla protein powder, watermelon, apricot, carrots, sprouts and red cabbage – a good combo that held be til lunch 4.5 hours later. 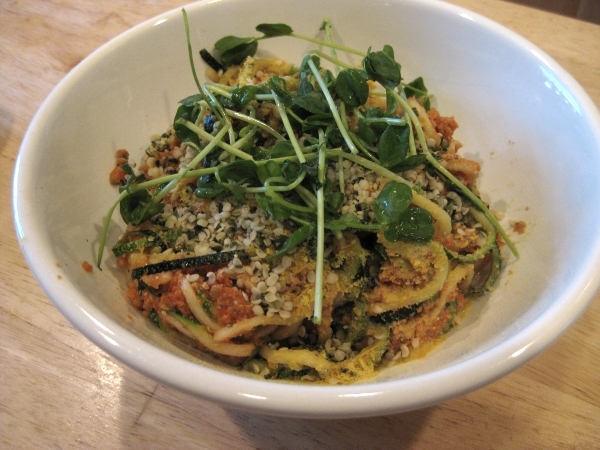 And that was leftover raw zucchini marinara topped with hemp seeds, nutritional yeast, Italian seasonings and sunflower sprouts. The zucchini noodles did fine in the fridge for 2 days because they were marinating in lemon juice, olive oil and the marinara sauce. Good to know that I can make a big batch of spiral sliced zucchini noodles to store in the fridge and eat from for a couple of days. 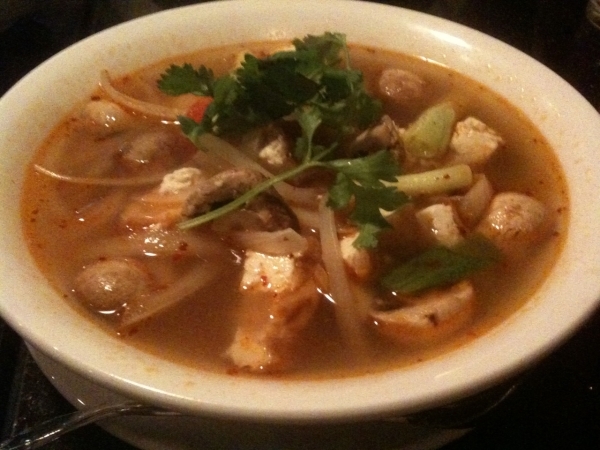 After work, hubby and I were fried from a crazy stressful week and triple-digit heat, we didn’t feel like lifting a finger in the kitchen and headed to a local Thai place that I haven’t been to in too long. I’m glad I rediscovered it because there was a vegetarian/vegan option for all the main dishes, you could order them with a meat, tofu or just veggies. I went with a tofu soup that was surprisingly good and loaded with kick. Mmmm, look at all the red pepper flakes. A little week on the veggies, hubby’s shrimp dish had more, but still a worthy vegan effort. 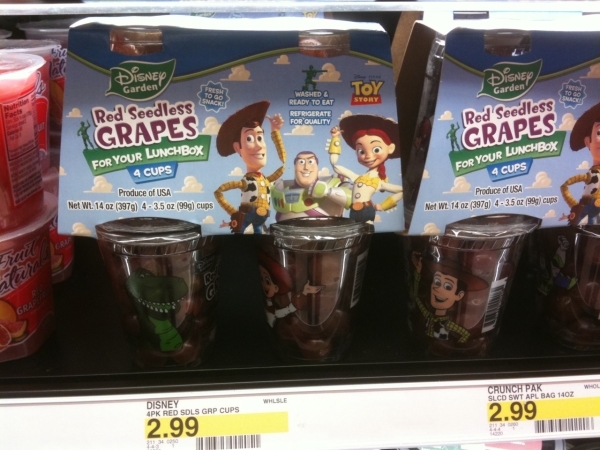 In the grocery section was Disney Toy Story branded fresh produce at a steep markup and using excessive packaging – it’s just grapes and apples trying to look like kiddie junk food, trying to make eating fruit look fun I guess. What do you think? I think that’s really interesting…on the one hand, it’s absolutely ridiculous, but on the other hand– if it gets kids to eat more fruit…I guess it’s a good thing? 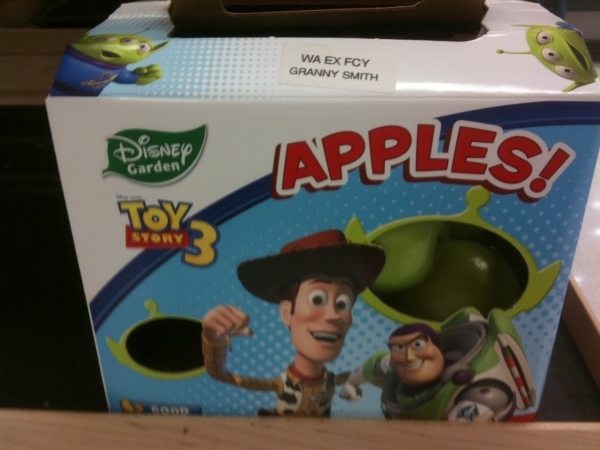 Any mother who can pay 75 cents for 20 grapes and has to indulge her child in Disney in order to get them to eat grapes (I mean maybe if it was spinach or broccoli I could even understand it a bit more) but if you are breaking out that kind of money AND calling upon the Disney magic…to eat grapes?! it’s like what has gone so terribly wrong in their world. I need to talk to her :) As a mom, the types of things i see other moms do, indulge in, not do (i.e. insist upon real food for their kids!) it sickens me all the time. I’m obviously not a parent, but can’t parents make eating fruit fun without all the packaging?